We had a fourth-down stand, a fumble recovery and two honest-to-goodness punts in the second quarter, but the offenses are still the story. Air Force opened the second quarter with a 12-play, 79-yard drive that took more than five minutes, even with the no-huddle attack favored by both teams. After five straight up-the-middle runs near the goal line, Falcons quarterback Tim Jefferson pitched wide to Asher Clark for a 1-yard score that tied the game at 21. Toledo followed with a 51-yard strike from Terrance Owens to Bernard Reedy; the duo’s second touchdown of the day made it 28-21. 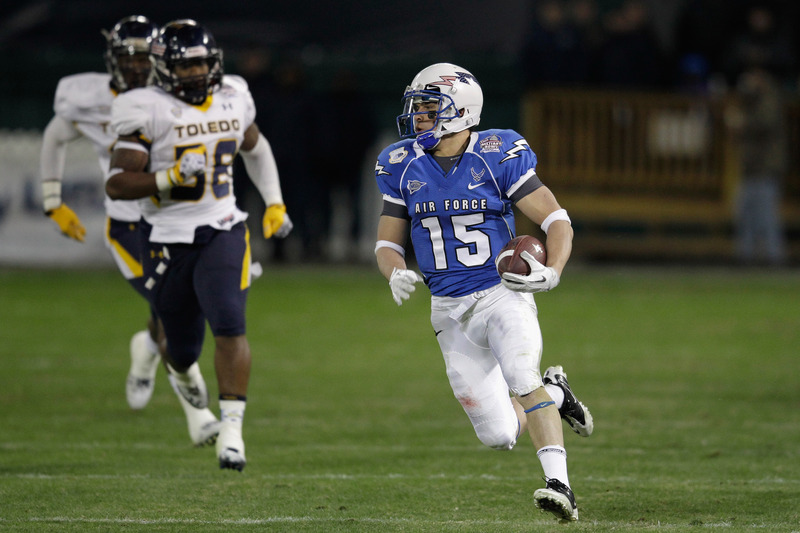 Air Force’s next drive stalled when Toledo stopped a fourth-down run by Jefferson, but Reedy fumbled following a long pass to give the Falcons another chance. They didn’t disappoint, covering 44 yards in less than two minutes thanks mostly to a 37-yard scoring pass from Jefferson to Jonathan Warzeka. After 30 minutes, we’ve got nearly 500 yards of total offense and 56 points. The old RFK scoreboard’s holding on, but just barely.